Posted on August 16, 2013 by Meera S.
You get these little bumps on your skin when you’re cold or when you feel any strong emotion, such as fear. But how does our body produce these bumps and why? And why are they called goosebumps? Goosebumps, also called cutis ancerina (which is the Latin translation of ‘the skin of the goose’), are the bumps that result from the erection of the hairs in our skin. It is an involuntary, or uncontrollable, response to cold temperatures or strong emotions. Last week, we talked about the four components of hair: the follicle, the shaft and the inner and outer sheaths. Each of your hairs’ outer sheaths, which encompass the follicle and the inner sheath, are surrounded by fibrous layers that attach to smooth muscles known as erector pili. These muscle are stimulated by the autonomic nervous system, which is the division of our nervous system that works with our conscious effort. The involuntary muscle reflex that causes goosebumps is referred to as the pilomotor reflex. When we’re in cold environments, our thermoreceptors signal to our brain that our body temperature is decreasing. This triggers the release of the hormone epinephrine (aka adrenaline), which targets these erector pili and causes them to contract. The contraction of these muscles causes our hairs to stand erect, which is also the cause of the bumps. In fact, erector pili literally translates to ‘a thing that erects hair’. See, scientific names aren’t that random at all! If you recall from that first post I did about anxiety, epinephrine is also released when one feels anxious. When this feeling is so strong that it promotes the release of a large amount of epinephrine, it can trigger the contraction of the erector pili in our skin, causing goosebumps. The same can be said for when you’re frightened, since the body mechanisms for anxiety and fear are similar. Okay… but why do we get goosebumps? Goosebumps are more helpful to animals than they are for us. That being said, goosebumps aren’t a total waste of energy for our bodies. It’s believed that the formation of goosebumps is a phenomenon that we inherited from our primal ancestors (for those who don’t believe in Evolution, their theory is still applicable to humans, don’t worry!). You see, we’re hairy mammals and our hair allows us to retain some heat, somewhat like a natural blanket. There is also a layer of air that surrounds our bodies that can serve as an insulator for heat. Now, in the case of the evolutionist theory, our primal ancestors had a lot more hair than we do; thus, they had a better blanket and more warmth. So, when they were in cold environments, their hairs would stand up (much like ours). These raised hairs causes the insulating air layer to expand, allowing your body to retain more heat. In other words, the expansion of this layer of air due to your raised hairs decreases the amount of heat that you lose to the cold environment. This theory can also be applied to us; however, we don’t have as much hair as the primal ancestors in the evolutionist theory. This means our ability to retain heat isn’t as efficient since the layer of insulating air wouldn’t be consistent due to the visible gaps between our hairs. But it can still be argued that goosebumps do try to help us stay warm! A reason for animals to have goosebumps can also be related to their predator-prey relationships. If a prey were to experience goosebumps upon seeing their predator (due to fear usually), their fur would make them seem bigger than they actually are since the hairs would be standing out. This would give them a better chance at intimidating the predator, which in turn means that they have a slightly better chance at surviving the encounter. Why are they called ‘Goosebumps’? But why not call it ‘Duck-bumps’ or ‘Chicken-bumps’ (which would make sense in terms of fear)? It really all has to do with which bird has been domesticated at the time the term was coined. For the English, Germans, Polish, Russians and others, geese had been domesticated. For the Spanish, they coined the term ‘piel de gallina’ which translates to ‘the skin of the hen’. The Japanese term is torihada, which literally means ‘bird skin’. So really, the term varies for different languages and cultures. So now you know what goosebumps are, how we get them, why we get them and why we call them goosebumps! And now you know that you can start calling them ‘duck-bumps’ without being wrong… That being said, I can’t promise you won’t get any strange looks. Bubenik, G.A. 2003. Why do humans get “goosebumps” when they are cold, or under other circumstances? ScientificAmerican.com. <http://www.scientificamerican.com/article.cfm?id=why-do-humans-get-goosebu>. August 15th, 2013. Parker, A. 2010. Five things you probably didn’t know about your body. TorontoSun.com. <http://blogs.canoe.ca/parker/general/five-things-you-probably-don%E2%80%99t-know-about-your-body/>. August 15th, 2013. Have a suggestion? Why not place it here? Posted on January 11, 2013 by Meera S.
Ever get too nervous to step onto a stage and speak in front of an audience? What about getting anxious about an upcoming test? Whether it’s when you think of the future or performing a simple task like driving, we’ve all felt anxious at one point. What is anxiety and why do you get anxious? Anxiety is often confused to be the same as fear, but I think it’s important to distinguish one from the other. Fear is your response to a known threat that’s in your surroundings while anxiety is more of a response to an unknown threat or an internal conflict1. We don’t fear the future because we don’t know what is in store for us, but not knowing what will happen can make us anxious. Even though they are caused by different situations, their modes of action in our body are the same. Getting anxious is simply the flight-or-fight response to an unknown threat and is meant to be a evolutionary response for survival2. Without anxiety or fear, we would probably be reckless and die at a young age as a result. How do you get anxious? Fear and anxiety are both emotions regulated by a part of your brain that’s called the amygdala3. When you’re in a situation that would normally lead to anxiety, such as having an internal conflict, a system known as the locus coeruleus (which is found in the pons), is signalled by the thalamus to release a hormone. 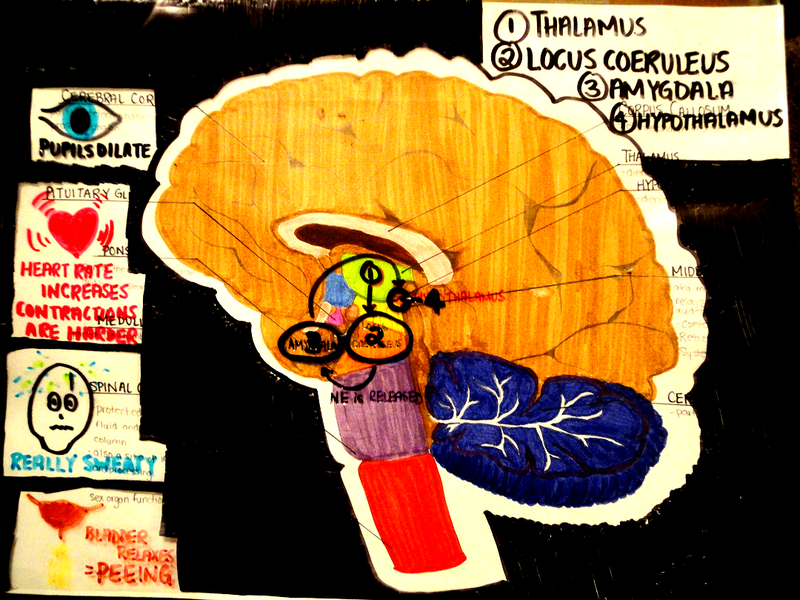 This hormone, norepinephrine (NE), targets the amygdala, in addition to other systems. This causes the amygdala to target another part of the brain (the hypothalamus), which causes the release of cortisol, epinephrine (aka adrenaline) and NE to induce the ‘flight-or-fight’ response4. Some cortisol goes back and targets the amygdala, which intensifies the signalling and, therefore, the symptoms1. The three hormones and the nervous system will target organs like your eyes, heart, sweat glands and bladder and will signal for the pupils of your eyes to dilate, your heart to beat faster, your sweat glands to release more sweat and for your bladder to relax. This relaxation of your bladder results in the likeliness of urinating if you are really anxious or scared. Hence the saying ‘I almost peed myself’. The general signalling path that results in anxiety and a few symptoms of anxiety. 1. Steimer, Thierry. 2002. The biology of fear & anxiety-related behaviours. Dialogues in Clinical Neuroscience, Vol, 4, No. 3, pp. 225-249. 2. DeMarco, Anthony J. 2009. The biology of fear and anxiety. MASCCares.com. <http://masccares.com/index.php?option=com_content&view=article&id=6:biologyoffear&gt; 02 January 2013. 3. Feinstein, J.S., Adolphs, R., Damasio, A., and Tranel, D. 2011. The human amygdala and the induction and experience of fear. Current Biology, Vol. 21, No. 1, pp. 34-38. 4. Layton, Julia. 2005. How fear works. HowStuffWorks.com. <http://science.howstuffworks.com/life/fear.htm&gt; 02 January 2013.